The inability to use one side of your body is a distressing thought for any person, let alone a child. However, hemiparesis is a challenge that many children who experience brain injury face. Hemiparesis is a condition where the entire left or right side of the body is weak as a result of a disruption in the connection between brain and muscle. Conditions that lead to hemiparesis include traumatic brain injury, brachial plexus injury and cerebral palsy, to name a few. This is where Handy Heroes come in. 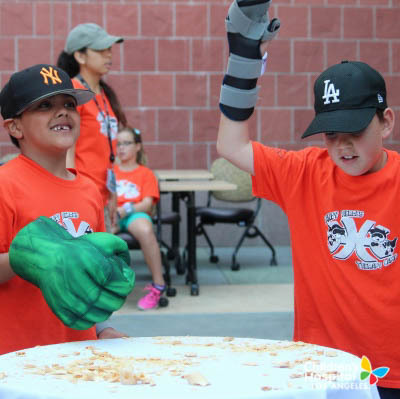 Handy Heroes therapy camp is facilitated by Occupational Therapy at Children’s Hospital Los Angeles, and aims to improve the functional abilities of the child’s weak upper extremity, or “Handy Hero hand,” as it’s known to the campers. Improvement in functional use of the impaired hand will significantly improve the campers’ ability to participate in everyday activities; in particular those activities that are bimanual (require the use of two hands). The two-week summer camp occurs every year in the last half of July and is the only one of its kind in California. The camp consists of constraint-induced movement therapy (CIMT) and intensive bimanual therapy. CIMT involves the constraint of the child’s unaffected hand in order to promote use of the Handy Hero hand. Each day of camp is assigned a specific theme, which highly motivates the campers. Examples of themes include pirates, Disney, Star Wars and LEGO. Each CIMT and bimanual activity incorporates the theme and is individualized to meet camper’s needs and goals. There is a low therapist-to-camper ratio (one therapist for every three campers) to ensure that activities provide the right challenge and facilitate growth. Prior to commencement of camp, each camper undergoes thorough standardized testing, which is re-administered on completion of the camp. Over the nine years the camp has been running, significant growth has been recorded for all participating campers. As campers return home, therapists help to maintain the progress they’ve made by educating campers and their families about activities that can continue to encourage use of the Handy Hero hand. By the end of camp, parents of our campers often report being thrilled with how much more their children were using their Handy Hero hand. Parents have informed us that the Handy Heroes therapy camp gave their children not only physical benefits, but emotional and social benefits as well. The camp creates a sense of acceptance, unity and empowerment among the campers. The opportunity to be in camp with other children with similar challenges is invaluable. 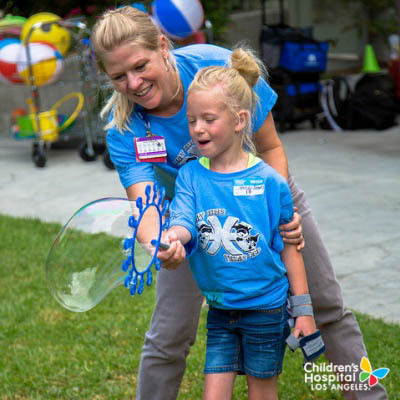 If you happen to see the campers roaming around CHLA at the end of July, don’t be afraid to give them a Handy Hero high-five. To find out more about Handy Heroes and how you can join, please visit: CHLA.org/HandyHeroes.